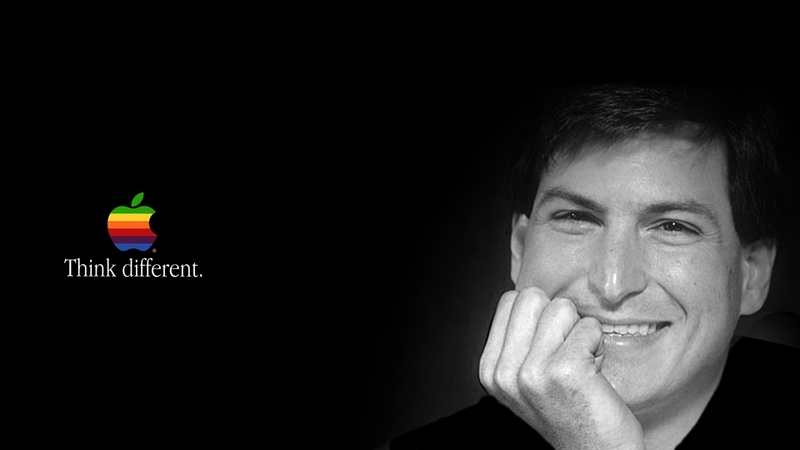 It will soon be one year since Apple’s co-founder and inventive genius departed in a hurry. There are many ways to remember him. I think of him as the quintessential maverick. Indeed, he turned that personal quality into a core value at Apple. That was also the theme of a memorable advertising slogan – ‘Think Different’ – that boosted the company’s sagging image in 1997. Jobs had just returned after 11 years in the ‘tech wilderness’. The campaign’s TV component, a commercial named “The Crazy Ones”, saluted notable mavericks through history. සිවුමංසල කොලූගැටයා #85: අපට සිටින්නේ නව නිපැයුම්කරුවන් ද? පේටන්ට්ධාරින් ද? In this week’s Ravaya column (in Sinhala), published on 30 September 2012, I discuss how to nurture a culture of innovation in Sri Lanka — a topic that I’ve been writing and talking about for over two decades. 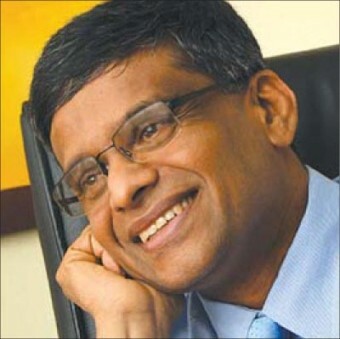 On the eve of the first major national exhibition of inventions, I discuss the role of Sri Lanka Inventors’ Commission (SLIC), state agency mandated to promote innovation, and talk to its head, Deepal Sooriyaarachchi. I revive a question first asked when Apple co-founder Steve Jobs departed one year ago: how do we nurture innovation in our kind of conformist and hierarchical societies don’t give mavericks a fleeting chance. Our cultures instead suppress individualism and iconoclasts. What is to be done? ශ‍්‍රී ලංකා නව නිපැයුම්කරුවන්ගේ කොමිසම සංවිධානය කරන ”සහසක් නිමැවුම්” ජාතික ප‍්‍රදර්ශනය සැප්තැම්බර් 30, ඔක්තෝබර් 1 හා 2 දිනවල කොළඹ BMICHහිදී පැවැත් වෙනවා. අපේ නව නිපැයුම්කරුවන්ගේ කුසලතා හා නිර්මාණ රටට කියා පෑම මේ ප‍්‍රදර්ශනයේ අරමුණයි. 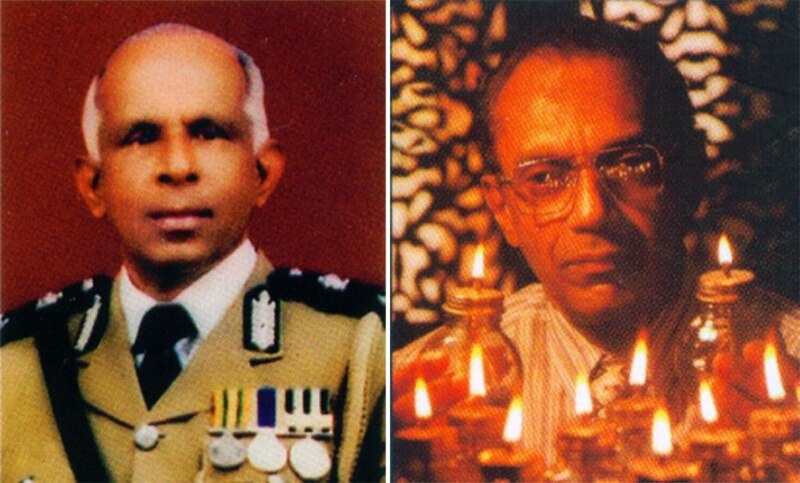 නව නිපැයුම්කරුවන්ට අතහිත දීමට 1979දී මේ රාජ්‍ය ආයතනය බිහි කරන ලද්දේ දුරදක්නා දැක්මක් තිබූ අමාත්‍ය ලලිත් ඇතුලත්මුදලි විසින්. කොමසාරිස්වරයකුගේ ප‍්‍රධානත්වයෙන් සැදුම් ලත් එය දැනට තාක්‍ෂණ හා පර්යේෂණ අමාත්‍යාංශය යටතේ ක‍්‍රියාත්මක වනවා. ආචාර්ය ඒ. එන්. එස්. කුලසිංහ හා ආචාර්ය රේ විජේවර්ධන වැනි කීර්තිමත් ලාංකික නව නිපැයුම්කරුවන් කලකට පෙර දැරූ කොමසාරිස් තනතුර දැන් හොබ වන්නේ අලෙවිකරණ ක්‍ෂෙත‍්‍රයේ විශේෂඥයකු වන දීපාල් සුරියාරච්චියි. පෞද්ගලික අංශයේ ප‍්‍රධාන විධායක තනතුරු දරා ඇති ඔහු මෙරට නව නිපැයුම්කරුවන්ට වෙළඳපොල ජය ගැනීමට අවශ්‍ය දැනුම හා අත්දැකීම් ඇති අයෙක්. නව නිපැයුම් කොමිසම ගැන කලක් තිස්සේ අවධානයෙන් සිටින මට පෙනෙන්නේ එය පිහිට වූ 1979 අංක 53 දරණ පණතින් ලබා දී ඇති වරම හා බලතල කාලයෙන් කාලයට වෙනස් ලෙසින් ක‍්‍රියාත්මක කොට ඇති බවයි. විටෙක උද්‍යොගිශීලිවත්, තවත් විටෙක නිද්‍රාශීලීවත් සිටි මේ ආයතනය ගැන මෙරට නව නිපැයුම්කරුවන් තුළ එතරම් පැහැදීමක් නැති බව ඔවුන් සමඟ කථාබහ කිරීමෙන් මා දන්නවා. විද්‍යා ලේඛකයකු ලෙස මාධ්‍ය හරහා නව නිපැයුම් ගැන ලිවීම මා දශක දෙකකට වැඩි කාලයක් කරන දෙයක්. නව නිපැයුම්කරුවන් හා ඔවුන්ගේ නව නිර්මාණ හඳුන්වා දෙන “මාලිමා” නම් ටෙලිවිෂන් වැඩසටහන් මාලාව මේ වසර මුල සිට මා රූපවාහිනී නාලිකාවෙන් ඉදිරිපත් කරනවා. 2009-10 කාලයේ සියත TV නාලිකාවෙන් “නවකම්” නම් වැඩසටහනෙන් ද මා එබන්දක් කළා. මේවා හරහා විවිධ වයස් මට්ටම්වල හා පසුබිම්වලට අයත් නව නිපැයුම්කරුවන් මුණ ගැසීමටත්, තොරතුරු විපරම් කිරීමටත් මට අවස්ථාව ලැබුණා. පොදුවේ ගත් විට මෙරට නව නිපැයුම්කරුවන් දැඩි උද්‍යොගයෙන්, කැපවීමෙන් හා ඒකායන අරමුණින් ක‍්‍රියා කරන පිරිසක්. සිය පවුලේ, පාසලේ හෝ කාර්යාලයේ දිරි ගැන්වීමක් ලැබුණත් නැතත් ධෛර්යවන්තව සිය ගමන යන්නට සවිය ඔවුන්ට තිබෙනවා. එහෙත් මේ පිරිස තුළ අපේ ජන සමාජයේ ඇති පුද්ගල හා චරිතගතිවල විවිධත්වය එලෙසින් ම හමුවනවා. ඇතැම් නව නිපැයුම්කරුවන් සංකල්පමය නව්‍යකරණයෙන් නොනැවතී ප‍්‍රායෝගිකව වෙළඳපොළ ජය ගන්නට වෙර දරන අතර තවත් සමහරු පසෙකට වී තමන්ගේ නව අදහස් හා නිපැයුම් රජය නැතිනම් වෙනත් පාර්ශවයක් මැදිහත්ව ප‍්‍රවර්ධනය කරන තුරු බලා සිටිනවා. නව නිපැයුමක බුද්ධිමය දේපළ තහවුරු කැරෙන පේටන්ට් බලපත‍්‍රයක් ලබා ගැනීම මහත් උත්සාහයෙන් කළ යුතු, කල් ගත වන හා ශ‍්‍රමය වැය වන කටයුත්තක්. එය මා කිසිසේත් අවතක්සේරු කරන්නේ නැහැ. එහෙත් හැම උපාධිලාභියා ම සැබෑ උගතකු නොවන්නා සේ හැම පේටන්ට්ධාරියා ම සැබෑ නිපැයුම්කරුවකු වන්නේත් නැහැ. පේටන්ට් යනු නව නිපැයුමක එක්තරා අදියරක් පමණයි. පේටන්ට් එකක් හෝ කිහිපයක් දැඩි ඇල්මෙන් හා ආඩම්බරයෙන් බදා ගෙන, එයින් ඔබබ්ට කිසිදු පියවරක් නොතැබූ හා එසේ නොවීම ගැන රජයට හා සමාජයට දොස් කියමින් සිටින නිපැයුම්කරුවන් ද විටින් විට මට හමු වනවා. මේ අය ගැන අනුකම්පා කරන අතර ඉතිහාසය පුරා ඔවුන් වැනි අය ඕනෑ තරම් සිටි බවත් සිහිපත් කළ යුතුයි. අමෙරිකාවේ ජේටන්ට් කාර්යාලය 1790 සිට 2008 දක්වා කාලය තුළ පේටන්ට් මිලියන 8කට වඩා නිකුත් කර තිබෙනවා. ගෙවෙන හැම වසරක ම නිසි විමර්ශනවලින් පසු අළුත් පේටන්ට් 150,000ක් පමණ නිකුත් කරනවා. මේවා අතරින් නව භාණ්ඩ හෝ සේවා ලෙස වෙළඳපොලට ළඟා වන්නේ සීමිත සංඛ්‍යාවක් පමණයි. පේටන්ට් කළ හැම නිපැයුමක් ම වෙළඳපොළට නොඑන්නට හේතු රැසක් තිබෙනවා. දැනට වෙළඳපොළේ හා පාරිභෝගිකයන් මුහුණ දෙන ගැටළුවක් විසඳීම අත්‍යවශ්‍යයි. එමෙන් ම එසේ විසඳන අතර එය භාවිතයට පහසු, සාධාරණ මිළ ඇති, මනා සේ බෙදා හැරෙන හා අලෙවිකරණය කැරෙන භාණ්ඩයක් හෝ සේවාවක් හෝ විය යුතුයි. ”නව්‍යකරණයේ වැදගත් ම ගුණාංගය නම් පාරිභෝගික අවශ්‍යතාවයන් හඳුනා ගෙන නිපැයුම් එ්වාට නිසි පරිදි අනුහුරු (adapt) කිරීමයි,” දීපාල් කියනවා. පේටන්ට්වලට ඔබ්බෙන් තිබෙන ඊළඟ අභියෝග ජය ගැනීමේදී මෙරට නව නිපැයුම්කරුවන්ට මඟ පෙන්වීම හා ආයෝජකයන් සොයා දීම සඳහා නවනිපැයුම්කරුවන්ගේ කොමිසම ශ‍්‍රී ලංකා අලෙවිකරණ ආයතනය (SLIM) හා ශ‍්‍රීජයවර්ධනපුර සරසවියේ පශ්චාත් උපාධි කළමණාකරණ ආයතනය (PIM) සමඟ සහයෝගයෙන් ක‍්‍රියා කරනවා. දිගු කලක් තිස්සේ නිලධාරිවාදය හා උගත්වාදය කරපින්නා ගත් කොමිසම, මෑතක පටන් නව නිපැයුම්කරුවන් කේන්‍ද්‍ර කොට ගෙන, ඔවුන්ට ගරුසරු ලෙසින් ආමන්ත‍්‍රණය කරමින්, සුහද මට්ටමකින් සිය අරමුණු සාක්‍ෂාත් කර ගන්නට තැත් කරන බව පෙනෙනවා. රාජ්‍ය ආයතනයක මෙවන් ආකල්පමය වෙනසක් කිරීම පහසු නැහැ. මෙරට නව නිපැයුම් ක්‍ෂෙත‍්‍රයේ නිලධාරිවාදයට එහා යන උගත් අධිපතිවාදයක් ද තිබෙනවා. පොතේ උගතුන් හා සරසවි ඇදුරන් මේ ආයතනවලට පිවිසී තමන්ගේ පණ්ඩිතකම පෙන්වන්නට අහිංසක නව නිපැයුම්කරුවන්ට අසාධාරණ කොන්දේසි පැනවීමේ අවලස්සන සම්ප‍්‍රදායක් තිබෙනවා. නව නිපැයුම්කරුවන් තම දෙපතුළට කැඳවන, ඔවුන්ගේ නවතම අදහස් විද්වත් ඇගැයීමට යයි කියා ලබා ගෙන තමන්ගේ පර්යේෂණ නිබන්ධනවලට ඒවා රහසේ ම ඇතුලූ කරන ඉංජිනේරුවන් හා විද්‍යාඥයන් ද මෙරට සිටිනවා. කොමිසම ටිකෙන් ටික නිලධාරිවාදය දුරු කරන අතරේ මෙරට උගතුන්ගේ දැඩි අධිපතිවාදයෙන් නව නිපැයුම්කරුවන් රැක ගන්නට ද යම් පියවර ගත යුතුයි. ශ‍්‍රිමත් ආතර් සී. ක්ලාක්ගේ පෞද්ගලික කාර්යාලයේ මා සේවය කළ දශක දෙක තුළ ඔහු හමු වීමට විවිධාකාරයේ නව නිපැයුම්කරුවන් පැමිණියා. තමා කෙතරම් කාර්ය බහුල වුවත් නව නිපැයුම් හා සංකල්ප රැගෙන එන අයට විශේෂ සැළකිල්ලක් දැක්වීම ඔහුගේ සිරිත වුණා. ඒ බොහෝ අවස්ථාවල සන්නනිවේදනයෙන් හා පසුවිපරම්වලින් මා සම්බන්ධ වුණා. පෞද්ගලික කාර්යාලයක ඇති සීමා තුළ දිය හැකි උපරිම දිරි ගැන්වීම, දැනුම හා ජාත්‍යන්තර සබඳතා ආදිය ලබා දීමෙන් අනතුරුව නිපැයුම්කරුවන් සමහරකු මොරටුවේ පිහිටුවා තිබෙන, ආතර් සී. ක්ලාක්ගේ නම දී ඇති (එහෙත් ක්ලාක් පරිපාලනයට කිසිසේත් මැදි නොවූ) රාජ්‍ය තාක්‍ෂණ ආයතනයට යොමු කරනු ලැබුවා. එබඳු අවස්ථාවල නව නිපැයුම්කරුවන්ගේ සමාජ තරාතිරම හා අධ්‍යාපන පසුබිම ක්ලාක්ට වැදගත් නොවූවත්, ඒ රාජ්‍ය ආයතනයේ ලොක්කන්ට එය මහ ලොකු සාධකයක් වූ සැටි මට සිහිවන විට තවමත් කම්පනයක් හට ගන්නවා. ගතානුගතික නිලධාරීන්ට හා උඩඟු උගතුන්ට වඩා වෙනස් ආකල්ප දරණ වත්මන් කොමසාරිස්වරයා, නව නිපැයුම්කරුවන් හරියට කලාකරුවන් වැනි යයි පවසනවා. ”නව නිපැයුම්කරුවන් බහුතරයක් දෙනා තමන්ගේ කාලයට වඩා ඉදිරියෙන් සිටින, අමුතු ආකාරයට සිතන අය. එබඳු අය හඳුනාගෙන ඔවුන්ට නිසි ඇගැයීම හා දිරි ගැන්වීම දිය යුතුයි. ජාත්‍යන්තර ක‍්‍රීඩා තරඟාවලදී පදක්කම් දිනා ගෙන මෙරටට පැමිණෙන ක‍්‍රීඩකයන් උත්සවාකාරයෙන් ගුවන් තොටුපලේ පිළිගන්නා ලෙසින් ම නව නිපැයුම් තරඟවලදී සම්මාන දිනා සිය රට එන නිපැයුම්කරුවන්ටත් පිළි ගැනීමක් දිය යුතුයි,” ඔහු කියනවා. නව නිපැයුම් කරන්නට උසස් අධ්‍යාපනය හා පශ්චාත් උපාධි තිබිය යුතුම ද? දීපාල් කියන්නේ අසම්මත විදියට සිතීම අධ්‍යාපනය හා සෘජුව සම්බන්ධ නැති බවයි. සමහර නව නිපැයුම්වලට විද්‍යා හා තාක්‍ෂණික දැනුම ප‍්‍රයෝජනවත් වුවත් වැදගත් ම අවශ්‍යතාවය නම් විවෘත මනසකින් හා දැඩි කුතුහලයකින් හැම දෙයක් ම ප‍්‍රශ්න කිරීමේ හැකියාවයි. ඒත් ශ‍්‍රී ලංකාවේ අධ්‍යාපන ක‍්‍රමය බොහෝ විට කරන්නේ සිසුන්ගේ මේ හැකියාවන් මොට කිරීමයි! නව නිපැයුම් සංකල්පයන් හට ගන්නේ පවත්නා තත්ත්‍වය එලෙසින් පිළි නොගන්නා, වඩා හොඳින් යම් යම් දේ කරන්නට ක‍්‍රම සොයා යන පුද්ගලයන් අතින්. ඕනෑ ම සමාජයක එබඳු අය ඉන්නේ ටික දෙනයි. රජයට හා විද්වත් ආයතනවලට හැක්කේ මේ දුර්ලභ මානව සම්පත් හඳුනාගෙන ඔවුන්ට නිසි පහසුකම්, මඟපෙන්වීම හා පිළිගැනීම ලබා දීම පමණයි. Despite the recent International Year of Chemistry (2011), chemicals don’t get good press in Sri Lanka. If at all they make it to the news, or become a current affairs topic, that is usually as a bad story: a chemical spill, water contamination or suspected pesticide residues in our food. All these happen, and we should be concerned. But chemicals are everywhere in our modern lives — reducing drudgery, protecting us from disease and overall improving the quality of life. It’s all a question of balancing risks with benefits. Also discerning what we really need as opposed to what we want. Focusing on bad news is the media’s typical approach, and demonising science and technology is common in many sections of our print and broadcast media. Such posturing also fits well into the prevailing narrative of the ‘whole world being out to undermine, destabilise and destroy us’. So chemical industries must be part of that ‘conspiracy’, no? 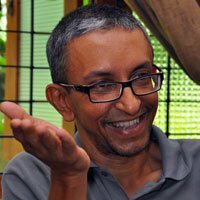 Many of Lanka’s environmental activists don’t allow facts and analysis to get in the way of a good scare story. Uncritical journalists and their editors often peddle their half-baked arguments and conspiracy theories unsupported by any evidence. Very few scientists speak out for science and reason. So when the Centre for Environmental Justice (CEJ), a moderate advocacy group, invited me to talk to a group of journalists and broadcasters at a media workshop, I welcomed the opportunity. I ended by urging journalists to look for credible and moderate scientists who are led by evidence, not conjecture or prejudice. Amplifying their voices is something we in the media are well positioned to do, but don’t do nearly enough. 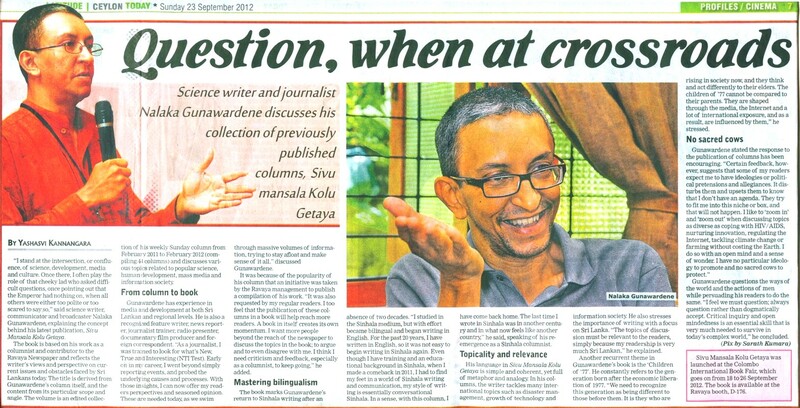 With that title, Ceylon Today on Sunday 23 September 2012 carries a profile of my new Sinhala language book, Sivu Mansala Kolu Getaya (SMKG for short). The article is written by Yashasvi Kannangara based on an interview with myself, and her reading of the book that came out last week. A recurrent theme in SMKG is my interest in Sri Lanka’s ‘Children of ’77’ — the generation who were born after the economy was liberalised in 1977 which, in turn, ushered in radical changes in our society, culture and media. So I’m intrigued to be profiled by a member of that very generation, @YashasviK! 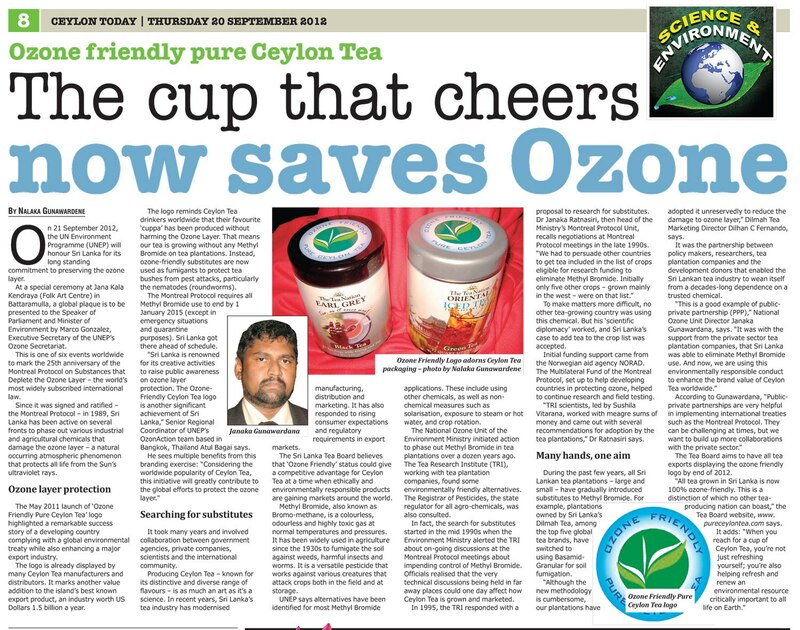 Disclosure: I’m also a columnist for Ceylon Today, where I write When Worlds Collide every Sunday. The misperception of the TV viewer in this cartoon (which first appeared in the Akron Beacon Journal in Ohio, United States, a few years ago) is more common that you’d imagine. In recent years, as climate change rose up in the news agenda and the public’s concerns, I have met many people – from different educational and cultural backgrounds – who confused or conflated the two issues. I once listened to a senior Lankan civil servant saying in a public speech that the ozone hole was “letting in the Sun’s heat that, in turn, was warming up our atmosphere”. He could have been forgiven – but as the then head of our environmental agency, he should have known better. This is the text of my (Sinhala language) column in Ravaya newspaper of 23 September 2012. I review two new books, both of much public interest, and written by two senior professionals who have been passionately committed to public safety for decades. 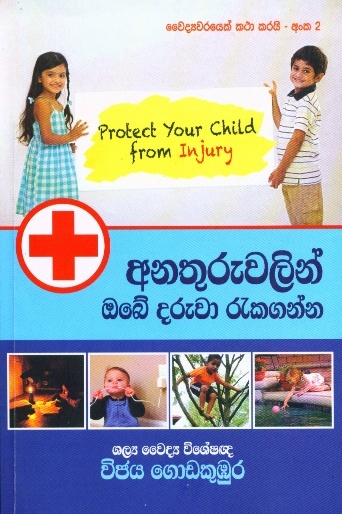 Protect Your Child from Injury (in Sinhala) is written by Dr Wijaya Godakumbura, while Traffic Signs, Road Markings and Traffic Signals is authored by T Perinpanayagam, a retired senior police officer. මේ සාහිත්‍ය මාසයයි. කොළඹ පොත් ප්‍රදර්ශනය පැවැත්වෙන සතියයි. මේ නිසා මෑතදී මට හමුවූ පොත් දෙකක් ගැන අද කථා කරනවා. පොත් ප්‍රදර්ශනය පැවැත්වෙන කාලය තුළ අළුත් පොත් සිය ගණනක් එළි දකිනවා. (මගේ 2011 කොලම් අතරින් 44ක් අඩංගු පොතක් ද ඒ අතර වනවා.) අතිශයින් විවිධ වූ රසිකත්වයකට හා පාඨක සමුහයකට දායාද කැරෙන මේ පොත් අතර නිර්මාණාත්මක මෙන්ම දැනුම වඩන පොත් ද තිඛෙනවා. පොතක අගය තීරණය වන්නේ එය පාඨකයන්ට සමීප වන ආකාරයටයි. ඇතැම් පොත් චින්තන විප්ලවයන් කරන අතරේ තවත් පොත් ඉතා ප්‍රායෝගික ලෙසින් ජීවිතය අර්ථවත්, සාරවත් කර ගන්නට අත්වැලක් සපයනවා. හැම පොතකට ම ජීවිත බේරන්නට බැහැ. එබඳු පොත් ලියැවෙන්නේ ඉඳහිටයි. ගෙවී ගිය සති කිහිපය තුළ දිවි සුරකින දැනුම කැටි කර ගත් හරවත් පොත් දෙකක් එළි දක්වන උත්සවයන් මෙහෙයවීමේ වරම මට ලැබුණා. ඒවා ලියා ඇත්තේ මා අගය කරන, පොදු උන්නතියට කැපවුණු වෘත්තිකයන් දෙදෙනකු විසින්. එයින් එක ලේඛකයෙක් දෙස් විදෙස් සම්මානයට පාත්‍ර වූ වෛද්‍යවරයෙක් හා නව නිපැයුම්කරුවෙක්. අනෙක් ලේඛකයා සිය කැපවීම නිසා ජනාදරයට පත් වූ හා ජාත්‍යාන්තර පිළිගැනීමක් ලද පොලිස් නිලධාරියෙක්. 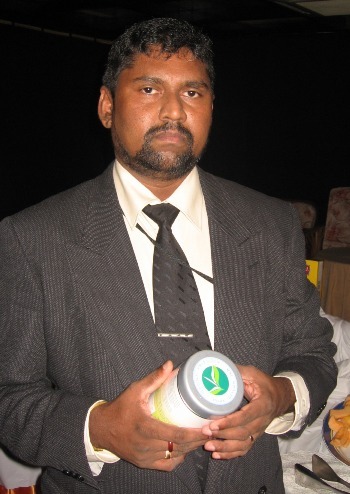 සුදීප ආරක‍ෂිත කුප්පි ලාම්පුවේ (www.safebottlelamp.org) නිපැයුම්කරුවා හා ප්‍රවර්ධකයා ලෙස ශෛල්‍ය වෛද්‍ය විශේෂඥ විද්‍යාජෝති විජය ගොඩකුඹුර මා මීට පෙර හඳුන්වා දී තිඛෙනවා (2012 ජනවාරි 15 කොලම). වසර 45ක් තිස්සේ මාධ්‍ය හරහා සෞඛ්‍ය දැනුම ඛෙදා දෙන ඔහු 1971දී ලියූ “වෛද්‍යවරයෙක් කථා කරයි” නම් කෘතියට රාජ්‍ය සාහිත්‍ය සම්මානයක් හිමි වුණා. දශක හතරකට පසු ඔහු ලියූ දෙවන සිංහල පොත නම් කර ඇත්තේ “අනතුරුවලින් ඔබේ දරුවා රැක ගන්න” කියායි. වාර්ෂිකව ලොව පුරා මිලියන් 5.5ක් (ලක‍ෂ 55 ක්) දෙනා විවිධ අනතුරුවලින් මිය යන අතර ශ්‍රී ලංකාවේ මේ සංඛ්‍යාව 12,000ක් පමණ වනවා. වැඩි වශයෙන් පුවත් වාර්තාකරණයට හසු වන්නේ මෙයින් සියයට 22ක් පමණ වන මාර්ග අනතුරුයි. එයට අමතරව දියේ ගිලීම්, පිලිස්සීම්, වැටීම්, විෂවීම්, මිනිමැරුම්, සියදිවි නසා ගැනීම් හා වෙනත් හදිසි අනතුරු නිසා නිකරුණේ හා අකාලයේ බොහෝ ජීවිත විනාශ වන සැටිත්, ඒ අතරින් ළමා ජීවිතවලට සිදුවන අනතුරු වැඩියෙන් ම ඛේදජනක වන සැටිත් වෛද්‍ය ගොඩකුඹුර සංඛ්‍යා ලේඛන දක්වමින් විස්තර කරනවා. ළමයින්ට අනතුරු වීමේ හැකියාව වැඩියි. ඔවුන්ගේ අනතුරු හඳුනා ගැනිමේ හැකියාව අඩු අතර කුතුහලය හා හැම දෙයක් ම ගවේෂණය කිරීමේ ආසාව ඉහළයි. මේ සංයෝගය ඇතැම් විට මාරාන්තික ප්‍රතිඵල අත්කර දෙන බව ඔහු කියනවා. මෙකී නොකී විවිධාකාරයේ අනතුරු වීමේ හැකියාව අප හැමගේ ගෙදර, වත්ත පිටියේ, මහමඟ, කඩමණ්ඩිවල හා කාර්යාලවල එමට තිඛෙනවා. ඩෙංගු මදුරු උවදුර ගැන රජයට හා පළාත් පාලන ආයතනවලට දොස් තබන අප, ගෙදරදොරේ වෙනත් දිසි හා අදිසි අනතුරුවලින් අපේ දරුවන් බේරා ගන්නට කළ හැකි සියල්ල කරනවා ද? අනතුරුවලින් ජීවිත හානි සිදුවූ විට අසීමිත ලෙස කඳුළු සළන අපේ ටෙලිවිෂන් නාලිකා, අනතුරු වැළැක්වීමට පුළුල් ලෙස ජාතික සංවාදයක් ඇති කරන්නට සෑහෙන ගුවන් කාලයක් කැප කරනවා ද? සෑම දිනක ම වළක්වා ගත හැකිව තිබු හදිසි අනතුරක් වළක්වා නොගත් හෙයින් දරුවකු අහිමිවීම නිසා ලෝකයේ පවුල් 2,000ක් අධික මානසික පීඩාවට පත් වන බවත්, දරුවන් පස් වැනි වියට පා තබන විට ඔවුන්ගේ ජීවත්වීමට ඇති විශාලතම බාධකය හදිසි අනතුරු බවත් ලෝක සෞඛ්‍ය සංවිධානය (WHO) හා එක්සත් ජාතීන්ගේ ළමා අරමුදල (UNICEF) උපුටා දක්වමින් වෛද්‍ය ගොඩකුඹුර කියනවා. අනතුරු දෙආකාරයි. “හිතාමතා ම කෙරෙන” හා “ඉබේ සිදුවන” (නොහොත් හදිසි අනතුරු) වශයෙන්. එහෙත් ගැඹුරට සිතීමේදී කිසිදු අනතුරක් ඉබේ සිදු නොවන බවත්, හදිසි අනතුරු සිදු වනවා නොව “සිදු වන්නට බොහෝ දෙනා ඉඩ හරින” බවත් ඔහු තර්ක කරනවා. මෙයට ප්‍රධාන හේතු වන්නේ නොදන්නාකම හා නොසැලකිල්ලයි. “මේ බව වටහා ගෙන තමාගේ නොදන්නාකම හෝ නොසැලකිල්ල නිසා තමාගේ හෝ වෙනත් අයකුගේ දරුවකුව අනතුරක් වීමට ඉඩ නොතැබීම අප සැමගේ වගකීමයි,” ඔහු අවධාරණය කරනවා. අනතුරුවලින් සියයට 95ක ම ළමා මරණ සිදු වන්නේ ශ්‍රී ලංකාව ද ඇතුළු අඩු හා මධ්‍යම ආදායම්ලාභී රටවලයි. එමෙන්ම සෑම එක් මරණයකට ම සාපේක‍ෂව දහසක් දෙනා අනතුරුවලට මුහුණ පා දිවි ගලවා ගන්නවා. එහෙත් ඒ ඇතැම් දෙනා සදහට ම දුබලතා, සමේ කැලැල් හෝ මෝළයේ ආබාධ සමඟ ජීවත් වනවා. ළමයින් අනතුරුවලින් බේරා ගැනීම දෙමවුපියන්ගේ හා සෙසු වැඩිහිටියන්ගේ වගකීමක් වන අතර එයට තුඩු දෙන සමාජ හා ආර්ථීක සාධක ගැන සමස්ත සමාජයට හා රජයට ද වගකීමක් පැවරෙනවා. උදාහරණ නම් ක්‍රීඩා පිට්ටනි නැතිකමින් මහ පාරේ සෙල්ලම් කරන ළමයින්, මහමාර්ග හා දුම්රිය මාර්ග අයිනේ (මිදුලක් නැතිව) නිවාස පිහිටා තිබීම, තාප්ප රහිත ළිං, වැටක් රහිත තරප්පු පේලි, අඩු මිළැති අනාරක‍ෂිත කුප්පි ලාම්පු භාවිතය. වෛද්‍ය ගොඩකුඹුර කියන්නේ නැතිබැරිකම ළමා අනතුරුවලට විවිධාකාරයෙන් දායක වන බවයි. උදා: ළමයින් හට සුපරික්‍ෂාව ලබා දීමට අපහසුවීම හා දැනුම, තොරතුරු හා සේවා ලබා ගැනීමට අඩු ආදායම්ලාභීන්ට අවස්ථා හිඟ වීමයි. අනතුරු වළක්වා ගැනීමේ දශක ගණනක සිය දැනුම හා අත්දැකීම් වෛද්‍ය ගොඩකුඹුර මේ පොතේ සරලවත් තර්කානුකූලවත් කැටි කොට තිබෙනවා. ඔහු එය තුන් ආකාරයකට වර්ග කරනවා. අනතුරක් මුළුමනින් ම වළක්වා ගැනීම ප‍්‍රාථමික ක‍්‍රියා මාර්ගයයි. යම් හෙයකින් අනතුරක් වූ විට ශාරිරික අනතුරු අවම කිරීම (උදා: ආසන පටි හා හෙල්මට් භාවිතය) ද්විතීය ක‍්‍රියා මාර්ගයයි. අනතුරකින් ශාරිරික හානි වූ විට ඵල විපාක අවම කිරීම තෘතීය ක‍්‍රීයා මාර්ගයයි (උදා: ප‍්‍රථමාධාර නොපමාව ප‍්‍රතිකාර දීම, නිසි පුනරුත්ථාපනය). මේ පොතේ මා දකින සුවිශේෂත්වය නම් අනතුරු වළක්වා ගන්නට, එක් එක් අයට ගත හැකි ලොකු හා කුඩා පියවර නිරවුල්ව ඉදිරිපත් කර තිබීමයි. මෙය දුවන ගමන් කළ මාධ්‍ය වාර්තාවක් නොවෙයි. කලක් තිස්සේ මහත් ඕනෑකමින් හා ක‍්‍රමීය මට්ටමින් අධ්‍යයනය කොට, මනසින් හා හදවතින් කරන විග‍්‍රහයක්. බෝවන රෝග වළක්වා ගන්නට රජය හා සමාජය දක්වන උනන්දුව අනතුරු වැළැක්වීමට ලැබී නැති බවත්, අනතුරුවලින් ආරක්‍ෂිත සමාජයක් බිහි කිරීමට අවශ්‍ය සියළු තොරතුරු දැනටමත් සෞඛ්‍ය හා අනෙකුත් අදාල බලධාරීන් සතුව ඇති බවත් කතුවරයා පෙන්වා දෙනවා. අනතුරුවලින් සංඛ්‍යාත්මකව වැඩි ප‍්‍රතිශතයකට වග කියන මාර්ග අනතුරු ගැන සිය ජීවිත කාලය පුරා මහත් කැපවීමෙන් ක‍්‍රියා කරන විශ‍්‍රාමික නියෝජ්‍ය පොලිස්පති ටී. පෙරින්පනායගම් මහතාගේ නවතම කෘතිය ”රථවාහන සංඥ, මාර්ග සළකුණු හා ආලෝක සංඥ” නමින් පසුගියදා ප‍්‍රකාශයට පත් වුණා. වෛද්‍ය ගොඩකුඹුර මෙන් ම පෙරින්පනායගම් මහතා ද දිවි සුරකින්නට සිය දිවිය කැප කළ, තම ක්‍ෂෙත‍්‍රයේ ගැටළු හා අභියෝග මනා සේ අධ්‍යයනය කොට, මහත් ඕනෑකමින් සන්නිවේදනය කරන්නෙක්. අපේ මහාමාර්ගවල කලක සිට පැවත එන රථවාහන සංඥ හා මාර්ග සළකුණු මෙන් ම අළුත් ඒවා ද දැන් දක්නට ලැබෙනවා. ඒ ගැන අළුතින් රිය පදවන්නට පටන් ගන්නා අයටත් කලක් තිස්සේ රිය පදවන හැමටත් නිරවුල් හා පැහැදිලි දැනුමක් ලබා දීම මේ කතුවරයාගේ අරමුණයි. නමුත් හුදෙක් රියදුරන්ට පමණක් නොවෙයි. මහමග ඇවිදින, බයිසිකල් හා මෝටර් සයිකල් පදවන සැමටත් අදාළ ප‍්‍රායෝගික දැනුම හා උපදෙස් මෙහි අඩංගුයි. එපමණක් නොවෙයි රථවාහන හසුරුවන පොලිස් නිලධාරීන්ට හා මාර්ග සළකුණු පිහිටුවීම හා නඩත්තු කිරීම කරන පළාත් පාලන ආයතන සහ (මාර්ග අධිකාරිය වැනි) සෙසු රාජ්‍ය ආයතනවලටත් වැදගත් වන සංකල්පමය නිරවුල් බව මේ පොතෙන් සැකෙවින් හා සරලව ලබා දෙනවා. 1957දී උප පොලිස් පරික්‍ෂකයකු ලෙස ශ‍්‍රී ලංකා පොලිසියට බැඳුණු පෙරින්පනායගම් මහතා 1993-1997 කාලය තුළ රථවාහන පරිපාලනය පිළිබඳ මෙරට මුල් ම නියෝජ්‍ය පොලිස්පතිවරයා ලෙස සේවය කොට විශ‍්‍රාම ගියා. රථවාන පොලිස් නිලධාරීන් පළඳින විශේෂිත සුදු ඇඳුම, තොප්පිය හා සුදුපටිය 1987දී ඔහු විසින් නිර්මාණය කරන ලද්දක්. ආරක්‍ෂිත මහාමාර්ග හා ප‍්‍රවේශම්කාරී මාර්ග භාවිතය ගැන ඔහුගේ උනන්දුව පොඩියක්වත් අඩු වී නැහැ. මාර්ග හා රථවාහන පුහුණු අධ්‍යාපන ආයතනයේ සභාපති හැටියටත්, දෙස් විදෙස් විද්වත් සමිති සමාගම් ගණනාවක ක‍්‍රියාකාරී සාමාජිකයකු ලෙසත් ඔහු සිය ක්‍ෂෙත‍්‍රයේ සක‍්‍රියව නිරතව සිටිනවා. 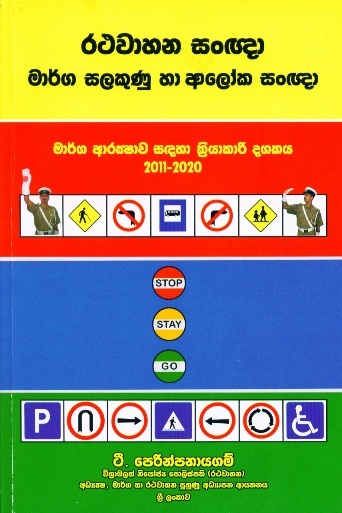 2011-2020 කාලය මාර්ග ආරක්‍ෂාව පිළිබඳ ක‍්‍රියාකාරී දශකය ලෙස එක්සත් ජාතීන්ගේ සංවිධානය විසින් ප‍්‍රකාශයට පත්කොට තිබෙනවා. එයට දේශීය වශයෙන් අනුබල දෙන්නේ WHO සංවිධානයයි. ශ‍්‍රී ලංකාවේ දිනකට මාර්ග අනතුරු 150ක් සිදු වන අතර එයින් ජීවිත අහිමි වන සංඛ්‍යාව 6 දෙනෙකු පමණ වන බවත්, 1977-2007 දක්වා 30 වසරක කාලය තුළ මාර්ග අනතුරු නිසා ලාංකිකයන් 40,000කට වැඩි පිරිසක් මිය ගිය බවත් WHO දේශීය නියෝජිත ආචාර්ය එෆ්. ආර්. මේථා පොතට පණිවුඩයක් ලියමින් කියනවා. මේ පොත් දෙකේ ම කතුවරුන් අපට මතක් කරන්නේ අනතුරුවලින් මිය යන සංඛ්‍යාවට ඔබ්බෙන් තවත් සමාජ බලපෑම් රැසක් ද ඇතිවන බවයි. දිවි ගලවා ගෙන ආබාධිත වන අය, නැවතත් රැකියාවක් කිරීමේ වරම අහිමි වන අය නිසා ඔවුන්ගේ පවුල්වලට, සමාජයට හා ආර්ථිකයට ඇති වන විපාක එක එල්ලේ ගණන් බැලීම පවා අපහසුයි. සියළුම අනතුරුවලින් තොරවු රටක් හෝ සමාජයක් හෝ නැහැ. එහෙත් පොදු හා පෞද්ගලික පියවර තුළින්, දැනුවත්වීම හා අවධි වූ සිහියෙන් ක‍්‍රියා කිරීම හරහා අනතුරු අවම කරගත් දියුණු රටවල් මෙන් ම දියුණු වන රටවල් ද තිබෙනවා. වෛද්‍ය ගොඩකුඹුර හා පෙරින්පනායගම් වැනි විද්වතුන්ගේ දැනුමෙන් හා දැක්මෙන් ලක් සමාජය නිසි ඵල නෙළා ගන්නට නම් රාජ්‍ය, විද්වත්, පෞද්ගලික හා ස්වෙච්ඡ සංවිධාන ඒ උතුම් අරමුණු වටා ඒකරාශි විය යුතුයි. ඒ සඳහා ඇස් හා මනස විවර කරවන මේ පොත් දෙක, සෑම ගෙදරක ම තිබිය යුතුයි.